Guwahati: Legendary singer-composer Bhupen Hazarika never had a dearth of listeners but his image surpassed popular imagination in neighbouring West Bengal, claimed noted Bengali lyricist Mintu Mukherjee. 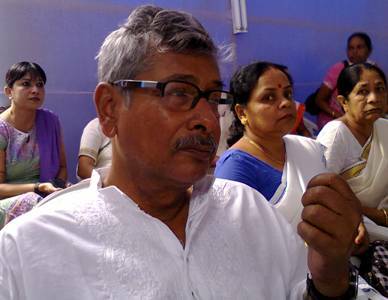 The veteran musician, who is credited with translating the bard’s songs in Bengali, was in Guwahati to pay tribute to Bhupenda on his first death anniversary on Monday. “Jekhane phul phute/ seikhane baroder gondhoke ghrina kora ek mon/ sei bidrohi mon take jatio smoron/dite hobe tar dam/ shardha bhalobasai dilam pronam,” the lines came out spontaneously, as Mukherjee sat on the courtyard of the balladeer’s residence in Nizarapar on Monday. Mintu Mukherjee at Bhupenda's residence. In an exclusive chat with Seven Sisters Post, Mukherjee said his visit to Assam will not be the same anymore, in the absence of the legendary singer-composer. “I was surprised to see Bhupenda’s popularity in Bengal. His image in Bengal is far bigger than in Assam. People there are still crazy for his songs,” he said after paying tribute to the bard. Mukherjee, who had been associated with Bhupenda since 1957, worked in several films together. Some of them went on to become colossal hits in Bengal and other places like Jeevan Trishna, Jonakir Aalo, Doi Beshra, Chameli Memsaab, Ekhano Pinjar and Gajmukta, apart from movies Rudali, Ek Pal, Darmiyaan: In Between, Aarop and Gaja Gamini. Mukherjee recounted the days he spent with Bhupenda in Kolkata and other parts of Bengal. “Not only Bhupenda, people who used to accompany him during concerts also used to get tremendous attention. During the Yuva Utsav in 1957, I was surprised to see the attendance of the crowd. Even though all the big names like Salil Choudhury and Hemanta Mukherjee had already performed, there were still 40,000-odd people cheering for Bhupenda when he came onto the stage. This was the kind of popularity that he enjoyed,” he said. Bhupenda performed in Kolkata for the last time in 1999. Mukherjee, who is a frequent visitor to Assam, is also familiar with other Assamese cultural icons like Bishnu Prasad Rabha. “I used to call him Bishnuda. Though I had not had the opportunity of working with him, I was well versed with his works. I was also aware that he deeply influenced Bhupenda and brought a sense of revolution in him,” he added.